The 154-year-old Veli Pasha Han in central Turkey's Çorum province will serve as a restaurant and a hotel after the restoration work is completed, the local mayor said Friday. Çorum Mayor Zeki Gül told reporters that the timber works and restoration work on the building's ceiling has already been completed. Located in Çepni neighborhood, the historic building was constructed in 1865 upon the order of Ottoman Governor Veli Pasha, and had been used for accommodation until a fire was broke out in the wooden building in 1914. 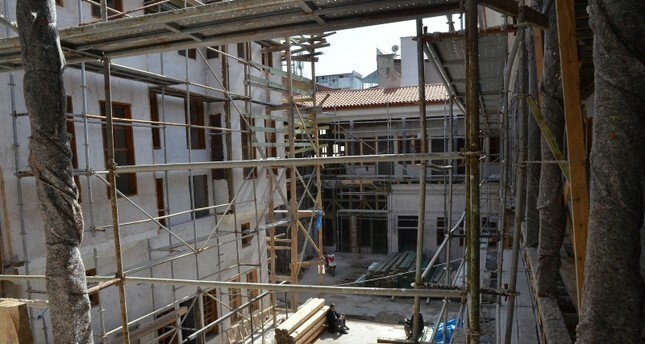 The heavily damaged building was partially rebuilt after the fire but the restoration work began a year and a half ago after it was rented by the Çorum Municipality. The historic building which is considered to be a special example of its kind in terms of decorations, crafting, and civil engineering, has three floors and 35 rooms. Gül said that the building is one of the rare works in the country as it has more multiple floors although it was built with a wooden frame system. The wooden building which served as an example for the "Han" buildings, a type of construction used for accommodational purposes during the Ottoman era, in terms of both its construction plan and architecture was built by using only wood and masonry materials.